Baba’s birthday is celebrated at Sadashiv Patel’s house in Poona (Pune). Here Baba declares Gulmai as his spiritual mother and Shireen as his worldly mother. With festoons, potted palms, flowers and garlands, all structures such as the Jhopdi, the Table Cabin, the dhuni, Upasni Serai, Sai Darbar and the Water Tank on Meherabad Hill were beautifully decorated for Baba’s 32nd birthday. Hundreds had already come the day before from different places. Beginning early in the morning of Thursday, 18 February 1926, thousands more, who traveled by bus, truck, car, tonga, and bullock cart, arrived forming a sea of humanity at Meherabad. Traffic on the Dhond road was continuous throughout the day, ferrying visitors back and forth to Ahmednagar. The arrangements concerning food and lodging for the guests, which Baba had insisted the mandali take care of several days before, were found to be inadequate. All the mandali awakened early on Friday, 18 February 1927 and took a bath at four o’clock. It was Baba’s 33rd birthday. The gong rang and everyone gathered around Baba, who dished out rawa (a sweet dish), along with two quinine tablets. 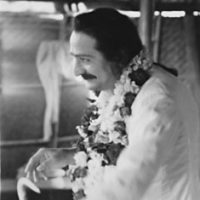 Baba later went to the women’s quarters at the Post Office and was invited to sit in an improvised swing which was rocked to and fro while the women sang Krishna’s cradle song. Baba distributes bundles of grain to the poor after washing their feet. This takes place at a primary school in Parner, Maharashtra. All paths are mine, and all lead eventually to me. But the shortest way to me is the no-path of self-annihilative love.